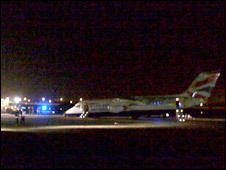 A British Airways jet from Amsterdam has been involved in an incident at London City Airport. Eyewitnesses say the front wheels by the aircraft's nose collapsed when the plane made a hard landing. The aircraft skidded to a halt on the runway and its 67 passengers and five crew were evacuated using the plane's emergency chutes. Six ambulances were called to the scene but there have been no reports of any major injuries. Passenger Justin Fletcher told the BBC: "There was obviously quite a loud bang as the plane scratched in, the stewards and stewardesses were quick to evacuate everyone off, there was a few scrapes and cuts due to hitting the asphalt, all in all everyone seems to be doing quite well now." A British Airways statement said: "Unfortunately one passenger sustained a minor injury and is currently on the way to hospital. There was one other minor injury. "We don't know the nature of the injury or how it was caused yet. Our priority at the moment is to ensure all the passengers involved in the incident are well cared for by our ground staff." The airport has been closed and flights have been diverted to other airports. The airport is mainly used for UK and European flights.